Ivan, Jennifer and I were waken up by Joshua on June 1, 2009. He told us that we would be leaving at 10 am. We had 20 minutes to get ready. We packed our backpacks up. We walked across the bridge to the parking lot. It took a few minutes for Joshua to arrive. The mini-bus took us to Kapit. We arrived at 10:35 am right near the pier. Ivan bought tickets for us. 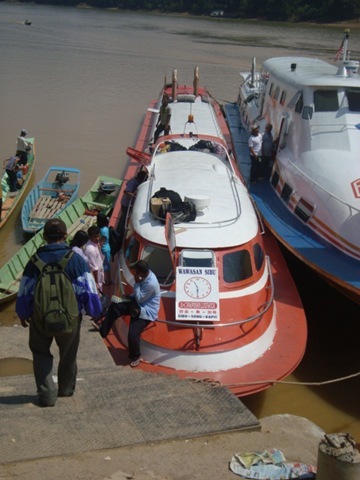 The next ferry was leaving at 11:30 am. We decided to find some breakfast. We sat down at the Kiew Ming Cafe. Ivan and Jennifer had boiled eggs, toast and tea. I had bananas on toast. We got the VIP tickets for the boat. The boat was empty. The VIP room had air-conditioning and a flat-screen tv playing a movie. Ivan and Jennifer watched Bangkok Dangerous on the laptop. I took a much needed monkey nap. We arrived in Sibu at 2:10 pm. We checked in at the Tanahmas Hotel. We had lunch at the Peppers Cafe inside the hotel. 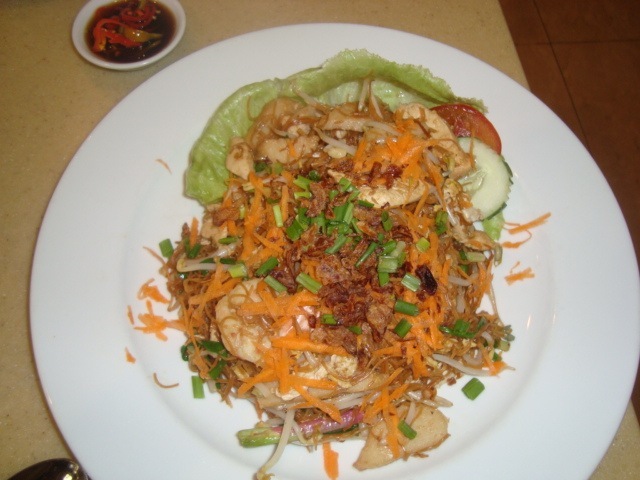 Ivan got the Fried Mee Sibu Style while Jennifer got a tuna sandwich. Jennifer asked for no tomatoes and no french fries. The guy repeated it and wrote it down. I got a banana and honey sandwich. The food came and Jennifer had tomatoes and french fries. Ivan was peeved and asked the employees about it. The manager said there would be no charge. Ivan and Jennifer shared the Jelly Pisang (a local specialty). It’s shaved ice with jelly (like Jello) and bananas. I tried some – it was good! 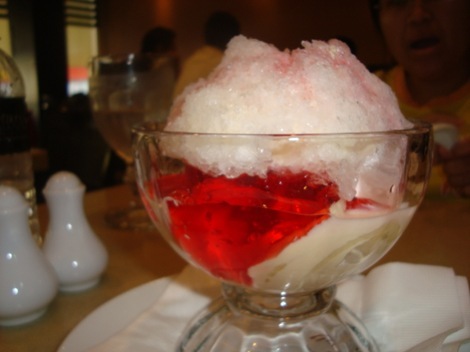 Jennifer said it’s similar to Halo Halo. We stayed in the room for awhile relaxing. We went to Wisma Sanyan mall. There’s a Sushi Tie located there. I ordered some banana sushi and chicken teriyaki. Ivan and Jennifer ordered salmon maki, unagi maki, unagi suhi, salmon and maguro sashimi, salmon teriyaki, chicken yakitori and unagi temaki. 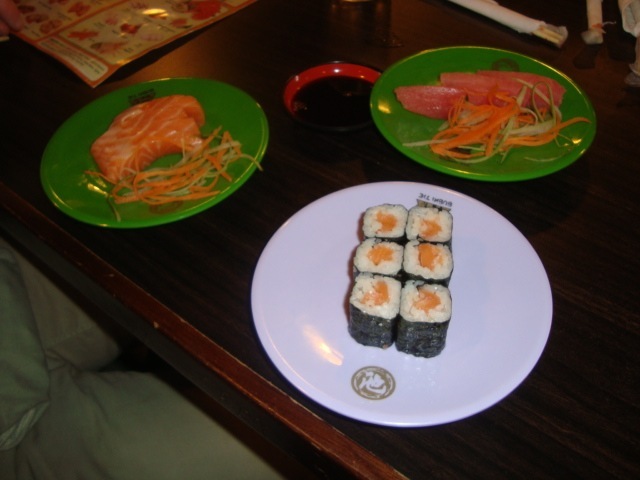 The maguro sashimi was frozen – so Ivan aked for salmon sashimi instead. The food was delicious! Ivan, Jennifer and I had lunch at the Kheng Hock Cafe on June 2, 2009. Ivan got the fish claypot while Jennifer ordered the chicken claypot. I got noodles with bananas. The food was good. Ivan and Jennifer were so stuffed after the meal. We chilled in the room. Ivan didn’t feel good that afternoon. Jennifer helped me with the blog. It was a lazy day for us. We had food from the Pepper’s Cafe brought to the room. I had the banana and chicken sandwich. Jennifer had a chicken sandwich while Ivan got a tuna sandwich. It was good. We went to sleep not long after.